Now, with fat biking in the picture, it is easy to enjoy biking in the scenic St. Croix River Valley for all four seasons while discovering Stillwater and Oak Park Hieght’s charm. This historic town is a beautiful place to visit or stay in while exploring all the local trails and the picturesque county roads for hiking, biking, and rollerblading. With trails connecting from the Twin Cities, you will find that this destination makes a great bike hub with many routes rolling into this riverboat community full of tasty food entrées and fun. 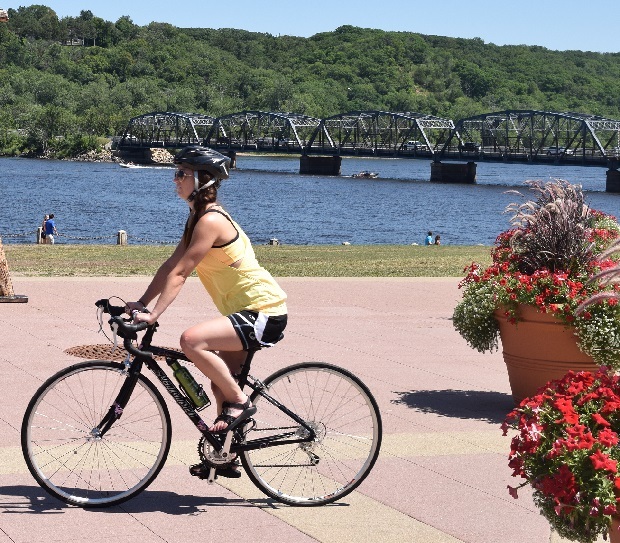 A cyclist enjoys riding her bike along the Scenic St. Croix River to the Browns Creek Trail in Stillwater, MN. When not biking, the warm summer air welcomes outdoor art fairs, restaurant patios, festival events, boating, and historic sightseeing. In the fall, you can enjoy the robust colors of the bluffs while local winery and brewery establishments offer the crisp flavors of the harvest. In between winter fat bike experiences, you should check out the holiday boutiques and antique shopping venues, or plan a romantic winter escape. The spring flowers that bloom in the parks and along the bike trail help to welcome another season to back again and again. In a relaxing setting and comfortable riding environment, you can plan your next bike getaway with family and friends to Stillwater in Minnesota. Being a bike-friendly area, you will find that riding the streets and roads here in Washington County are safe and relaxing. Plus, they have miles of local and state (paved) trails nestled in the scenic river valley. For the mountain biker, you will also find several trail options nearby. From Chilkoot Cafe to Lolo American Kitchen, one of the finest in the area, Stillwater offers several interesting and charming cafes, coffee shops, and ice cream shops ideally suited to a cyclist’s taste. Along with most hotels, coffee shops and restaurants have Wi-Fi availability. Additionally, the Stillwater Public Library is another good option and is located at 224 3rd St. N., Stillwater, MN 55082. You can reach them by telephone at 651-275-4338. See the Stillwater Tourism Bureau for more detailed information.